Fisher Price is one of Spud's favourite companies, the reason, they make the majority of all the Mickey Mouse toys he has and puts on his Birthday and Christmas list. Fisher Price most recently sent Spud the Mickey Mouse Fly n Slide Clubhouse, you can read the review here. Fisher Price was the first big company who gave me trust when I was new on the blogging scene and for that I thank them, I am delighted to know they still want to work with me and I hope we have a working relationship together for a long time! You can find all the reviews I have done so far for Fisher Price on my reviews page. 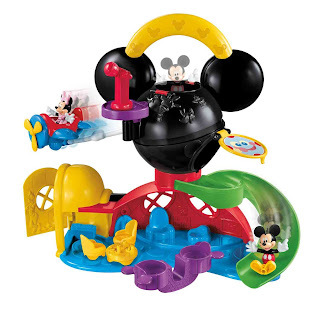 For now though, the very fabulous team at Fisher Price have very kindly put aside a Mickey Mouse Fly n Slide Clubhouse for one of my very lucky readers/visitors to win!